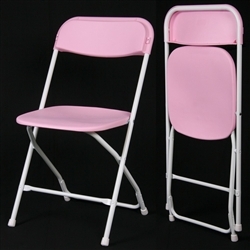 Hot Pink - When folded our lightweight folding plastic chairs are the strongest on the market. Our Samsonite Type Folding Chairs interlock, allowing you to stack up to 60 chairs. Only our Plastic Folding Chairs come with a 5 Year Replacement Warranty - White Stacking Folding Chairs since 2002.